When I began this experiment (only a few months ago, as crazy as that seems), I planned on coming up with a regular update schedule that wouldn't severely impact my writing time. My intention was to post once a week, occasionally twice. 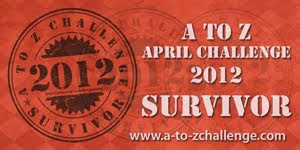 Less than a month later, I signed up for the A to Z Challenge on a whim, dooming those plans for the month of April. Now it's behind me, and despite the cut it made into my usual writing marathons, I'm glad I did it. It was worth it. It was nice to prove to myself that I could keep a breakneck blog schedule without much prep time beforehand. I made a commitment to post every entry on time, without sacrificing the length or quality that I've tried to hold myself to in previous entries. It got rough there for a while, especially toward the end when I was feeling a bit of blog fatigue. But I think AuthorAlden.com benefited greatly from the work I put into it while riding the A to Z crest. I've gained a new blog series that will continue in the future (see below), I generated more content in that one month than in all of my previous entries combined, and my follower count more than doubled, as did the number of blogs that I'm following. Not too shabby, eh? I really enjoyed working with the theme I used for the A to Z Challenge, and since some of you seemed to have liked it as well, I've decided to make it a monthly feature. Starting in June, the first Monday of every month will feature a new post in the Speculative Fiction Tropes Series. I've added a button on the navbar that leads to a directory of every post in the series, in case you missed any. I hope those of you who enjoyed my A to Z entries will continue to follow along. It should be much easier now that I'm not restricted by the alphabet! And a huge thank you to everyone else who's taken the time to give my blog a read since I started this thing, especially my followers and subscribers. There's too many of you to list, but you have my sincerest appreciation. Until next year, alphabet. I'll be ready for you. It was my first year with the A to Z Challenge. I likewise picked up a myriad of new followers and met a lot of new people along the way. I hope to visit here to stay caught up with your blog. Congrats on surviving it, Jeremy! Thanks for reading, I appreciate it. Great job with this challenge! I loved reading your posts, and I'm really thankful to have met you. Yep! I'm amazed I managed to make it this far! Thanks so much, Vero. Ditto on both accounts. Your constant encouragement was much appreciated during the challenge! Wow, thanks for the mention J.W.!!! It was fun wasn't it? You're very welcome. It was a blast! I don't even know what I did but glad I did it! Happy you enjoyed your experience with the Challenge. It can really push one further in writing, even if one's not writing much outside of the Challenge. And the best part is the new friends. Loved how you handled the challenge, Alex! Yours was one of the blogs I kept following along while cruising the other challengers. I enjoyed your posts on spec fiction, and will come back for your Monday posts as well! Thanks, Catherine! Glad to have you aboard. Glad you enjoyed it. I appreciate you following along! I liked your A to Z entries, as well. You were one of the ones I kept up with regularly after we became acquainted. It was rough, that's for sure! I don't blame you for dropping out. At least you'll know it's coming next time around. I loved your theme. I'll be looking forward to more Speculative Fiction tropes! Thanks so much, Lauren! At the beginning I wasn't sure if I'd be able to pull my theme off, but it ended up being great fun. Hey, JW-- Thanks for the shout out! It's been great following you along for the past month and I'm glad you did this challenge, as well. I learned a lot from you and I know that as I continue to follow your blog I will certainly learn loads more! Congratulations on a most successful A to Z run! No problem, Randi. I was glad you enjoyed it, and I appreciate you following along with me! I learned a lot during the challenge myself, especially about how my blog is taking shape. I hope can keep writing things you enjoy! The Challenge is a good way to get motivated. I wasn't very organized this year, but managed to reach the finish line. Absolutely. Congrats on surviving it, J.L.! Glad I was able to make your list... it is one wild ride! Thanks, Jeremy! You were encouraging, and I loved your theme for the challenge. Will definitely keep following your blog until the next one. I don't know everyone on your list but the team leaders on it were certainly a good help along the way of the challenge. How great you've got a series set up from this. I agree, DayDreamer! They did an excellent job. Thanks for stopping by! I admire your gumption, Evalina! Thanks for visiting. I'm glad you got something out of the Challenge and that it was a positive experience. Thank you for being a part of it. It was a great experience, Lee. Thanks for your contribution to the challenge! I just started reading your blog thanks to Randi Lee, and you truly deserve the award. You have a great amount of advice, info, and i love the recommendations you offer the readers. Not to mention the A-Z challenge, that was most impressive! I really look forward to watching you and reading more posts of what you have to give to the writing community. I just feel bad I have missed out on something so great for so long. Thank you for such awesome contributions! Look forward to being the Padawan to your Obi-Wan! Just kidding, of course. Thanks so much for the kind words, Paige. I'm so glad you were able to get something out of all this. I still feel like a padawan myself most days, so if a fellow writer can find something useful out of my rantings, I'm more than happy. Welcome aboard! Don't be a stranger!